Jarkko Ruutu – Super Pest or Super Hero? Every NHL team has at least one – the mucker, the grinder, the pest, the shift-disturber; a third or fourth line player that heads into the corners with his head down and his elbows up, looking to raise the energy of his teammates, and hopefully draw a penalty for his efforts. They are the guys you love to hate when they play against your team, and the guys you love to have when they wear your team’s uniform. Through the first part of the NHL schedule, the one word that describes the Ottawa Senators is inconsistent. However, one line combination that has played above their abilities, going back to last season, is Ottawa’s third line of Chris Neil, Chris Kelly and Jarkko Ruutu. There is no doubt that Chris Kelly is the playmaker on this line, with Chris Neil providing the muscle as Ottawa’s enforcer (along with defenceman Matt Carkner), which leaves Jarkko Ruutu as the resident shift-disturber. Love him or hate him (most hockey fans hate him); there is no doubt that Ruutu has carved out a role for himself in the NHL. The feisty Fin recently reached a career milestone of his own to go along with Daniel Alfredsson’s 1,000 points and Sergei Gonchar’s 1,000 games. In his last game, Ruutu reached the 1,000 penalty minute plateau. The third round selection (68th overall) of the Vancouver Canucks in the 1998 entry draft, Ruutu has played nine full seasons in the league and parts of two others (he played in 8 games with Vancouver in 1999-2000 and 21 games in 2000-2001). In 590 NHL games with the Vancouver Canucks, Pittsburgh Penguins and the Ottawa Senators, he has 56 goals and 77 assists to go along with his 1,000 minutes in the sin bin. Last season, at thirty-four years old, he played all 82 games and set career highs in goals scored (12) and total points (26). While controversy usually follows Ruutu around on the ice, he is a quiet man off the ice (and one heck of a Zamboni driver). His frequent “diving” has not earned him many fans around the league, but they may one day lead him to competing in the Summer Olympics. He has been suspended on several occasions, perhaps the most famous suspension coming during his first season with Ottawa when he lost two games for “biting” the finger of Buffalo Sabres forward Andrew Peters. Ruutu’s response when asked post-game about the incident was that Peters had gouged his eye and stuck his fingers in Ruutu’s mouth – it was a natural response to chomp down on the fingers. One area where Ruutu differs from most bottom-six NHL forwards is the fact that when Finland enters International competitions, whether it is the World Championship or the Olympics, the Helsinki native is always wearing the national colours with pride and representing his country. While he is still looking to have his name etched on the Stanley Cup, he has a silver (2006) and a bronze (2010) medal from the Olympics and three silver (1998, 2001 and 2007) and a bronze (2006) at the World Championship, a very impressive collection of hardware for a grinder. 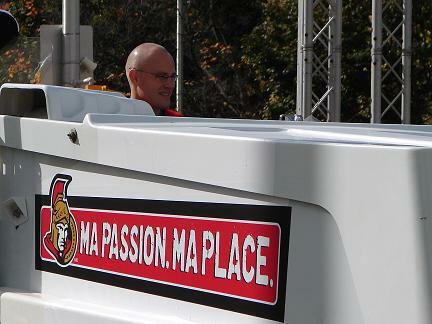 In the final year of his contract with Ottawa, there is a very real possibility he has earned a contract extension. 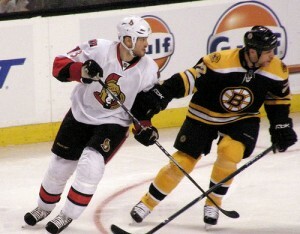 He has become a fan favourite with the Sens Army and along with Chris Kelly; he is a very effective penalty killer. The spotlight may not shine on Ruutu very often, but he has certainly brought an interesting style to a Senators team searching for an identity. Perhaps Ruutu can be the first nominee for a Super-Pest Award – the “Esa Tikkanen Trophy”… He knows his role and he is one of the best in the league when it comes to annoying his opposition into taking a penalty. So, what do you think hockey fans – Jarkko Ruutu: Super Pest or Super Hero?